Gust Gab: Summer Kick Off - Celebrating with Hormel Foods! Summer Kick Off - Celebrating with Hormel Foods! We wait a long time for the month of May, here in the great state of Minnesota. Winter ranges anywhere from 3 to, oh, like 9 months around here...and come May, we are ready to be outdoors, to dust off the cobwebs from the long winter, and celebrate!! this, that and the other thing! From Cinco de Mayo Festivities to End of the School Year Parties and Graduation Parties, to Memorial Day BBQ's...there is no shortage of reasons to get together with friends and family. Whether you are entertaining and hosting a get together, or you simply need to bring a dish to share ~ Hormel Foods has many great recipes for every occassion. I've shared with you our absolute favorite Hormel Foods Beef Fajita recipe before ~ oh how we love this one! 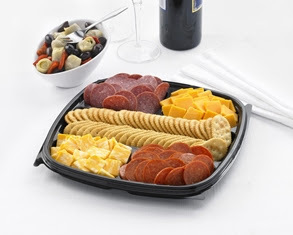 Other great ideas are simply picking up a Hormel Party Tray - all ready to go, just remove the lid! Click HERE for the recipe for Bacon Onion Dip! What screams summer get together like Potato Salad? CLICK HERE for the Beginner (YAY!) recipe & directions! Do you have a favorite go to dish for summer gatherings? Do you get more elaborate if you are hosting, or if you are bringing a dish to someone else's get together? For great money saving coupons on the Hormel Foods you know and love - Click HERE! That Bacon Onion dip looks like it would be worth trying out. Thanks Darcie!